The Squeezor is Coming! 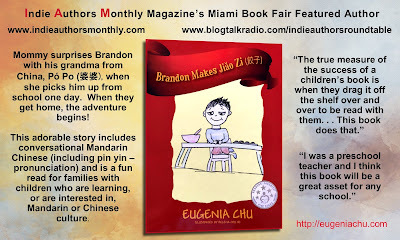 is a children’s book written by Becky Benishek and illustrated by Matt Fiss. The Squeezor is a friendly monster who just wants to give hugs, but he looks so scary, other monsters run away from him! How can he get them to look past his appearance and be friends? Then he gets an idea: It isn't about what he wants, but what the other monsters need. Monsters overflow in Becky Benishek's new children's book about the power of empathy and why it’s so important not to judge on appearances. Your whole family will enjoy the imagery and important lessons underneath it all. By Becky Benishek. Illustrations by Matt Fiss. The Squeezor is a monster who loves to give hugs. Great, big, wrap-his-arms-around-you-twice, squeezy hugs. The trouble is, the Squeezor doesn’t look like he just wants to give you a hug. He looks like he wants to eat you up! “The Squeezor is coming!” all the other monsters would shout when he came to the nearest town, Ghastly Gigapolis, for supplies. From behind shop doors and curtains, from roof peaks and from alleyways, from third-floor house windows and through cellar-door slats, monsters furry or feathered, scaly or slimy, big or small, quivered as the Squeezor stumped along the sidewalk on his squat legs and big, squashy feet with three greasy toenails each. They trembled at the sight of his giant, curved horns and frightfully fanged grin. Even the fur on his big blocky shape looked all wrong—a sickly, saggy mix of lime green, purplish brown, and mustard yellow. And they were practically petrified at the chillingly sharp claws that glinted at the end of the Squeezor’s wrap-around-you-twice arms! This made the Squeezor very sad. The Squeezor stayed home all that day to think. He didn’t have to worry about being disturbed because nobody ever came to visit him. He wandered into his library and leafed aimlessly through 7 Habits of Highly Disgruntled Monsters; then he read, How to Stop Worrying and Start Eating, and he finished up with, I’m Okay, You’re Decaying. None of them helped, not even the one called, First Things First: 10 Tasks to Sink Your Teeth Through. He went into his kitchen and half-heartedly stirred up a pot of his favorite, putrid green tomato soup and slowly munched a moldy grilled cheese sandwich. He didn't really feel hungry, though, and wasn't even tempted by the box of Nose Nougats on the counter. He switched on the television in the living room to look for an advice show. One of the channels was running a marathon of Game of Bones, and he'd watched two and a half episodes before he realized it. The Squeezor didn't even like Game of Bones. He switched off the set. "How can I change anything when I can't even figure out what to do with myself?" he grumbled as he wandered around his house. Just then, he stopped short in the hallway, under a portrait of his Great-Grandmother Squeezums, who always seemed to be glaring lovingly at the Squeezor. "Maybe that's it!" he said. "Maybe it's not myself that I have to figure out." The Squeezor, excited now, heated up another bowl of putrid green tomato soup, ate half the box of Nose Nougats (the box itself was edible), and didn't go to bed until he had a plan. Monsters overflow with a great message and fun reading for kids AND adults in @beckybenishek's new book. Get THE SQUEEZOR IS COMING! at https:/bit.ly/SqueezorMCP. Buckle your seatbelts! Your child 6–10 is about to take off on a trip of adventure, discovery and learning with the Award-Winning Series: Bonjour! Let’s Learn French and Hola! Let’s Learn Spanish. Easy to use, whether or not you know Spanish or French. Your child’s guide is Pete the Pilot. Kids take a pretend flight to Mexico and France. 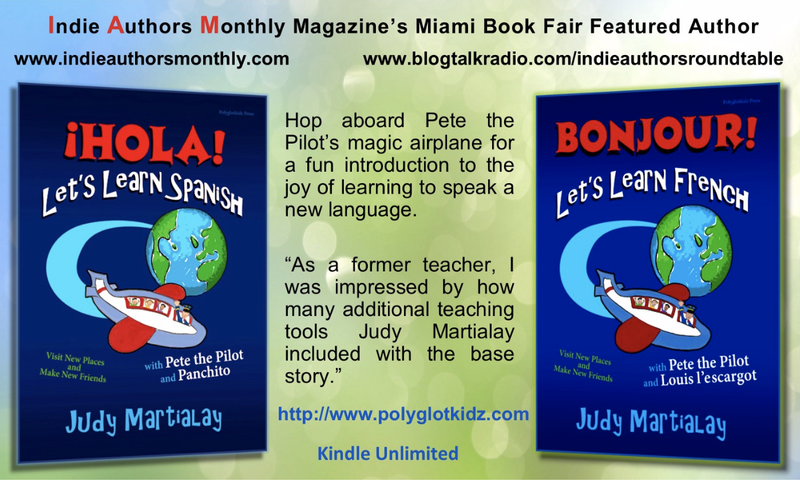 Free downloadable audio version at polyglotkidz.com. Download before using book. Hi, I’m Judy Martialay. I live in Sea Cliff, N.Y. with my husband. My daughters are grown up. I have a toddler granddaughter. I have lots of interests; I am a guitar jammer, a painter, gardener, knitter, volunteer, and I love to cook (but have to watch my sugar). I studied Japanese but had to give that up when my Japanese friend with whom I exchanged lessons moved away. I retired from teaching foreign /world languages, and now I devote time and energy to advocacy for foreign language study for the Public Advocacy Committee of the New York State Association of Foreign Language Teachers (NYSAFLT). Foreign language learning is an uphill battle in the English-speaking countries. I think, though, that more parents are becoming aware of the many benefits of being bilingual, and they want their kids to learn languages. I wrote the books ¡HOLA! Let’s Learn Languages and Bonjour! Let’s Learn French because I want every child to have the opportunity to learn a world language at an early age. This is the best time to start learning a language. Children’s brains are wired for learning languages. They have a better chance for acquiring native pronunciation, and they have ample time to become truly proficient in the language. I often hear the comment from teachers of young children:” Children absorb languages like sponges.” My granddaughter hears Spanish every day; she has an au pair girl who speaks to her in Spanish. She understands everything. I want children and their parents to enjoy the experience of learning languages. It is an adventure into the soul of another world. If your child continues study of a language, he or she will have a skill that will provide life-long benefits. 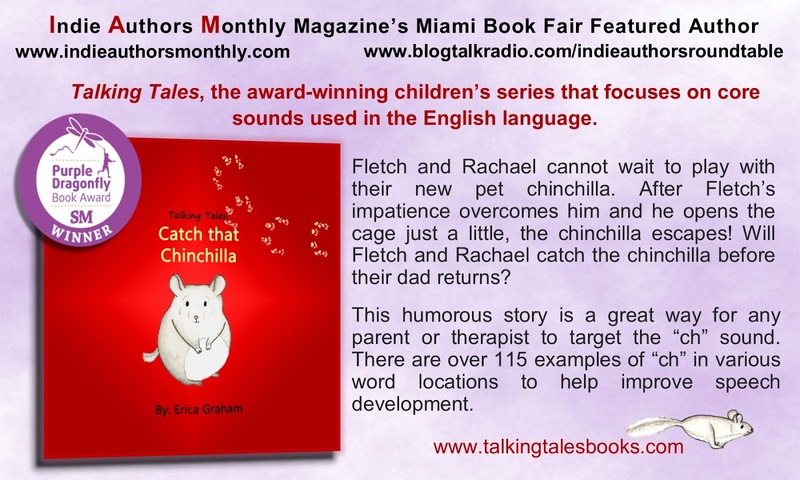 Talking Tales-whimsical stories that entertain and teach as each story centers around a core sound in the English language. The series includes Catch that Chinchilla, Puppy’s Bubble, Cricket’s Guitar, The Bright Red Tricycle, and Sam’s Sticky Sucker. What a fun way to help your child’s speech development. Erica Graham is an award-winning children's author. Graham graduated from Southern Illinois University Edwardsville with her Master of Science Degree in Speech Language Pathology. She also holds her Certificate of Clinical Competence with the American Speech-Language Hearing Association. As a mother, Graham understands the difficulty parents have finding time to work on speech with their children. In her pursuit to create a fun easy way for therapists, children, and their parents to enhance speech development while promoting literacy, she has written a series of exciting children's books. Each book focuses on a core sound used in the English language. Outside of writing and working as a Speech Language Pathologist, Graham enjoys spending time outdoors with her husband and daughters, volunteering with the youth group at church, and a good cup of tea. Are you ready to delve into a fun and exciting travel adventure? 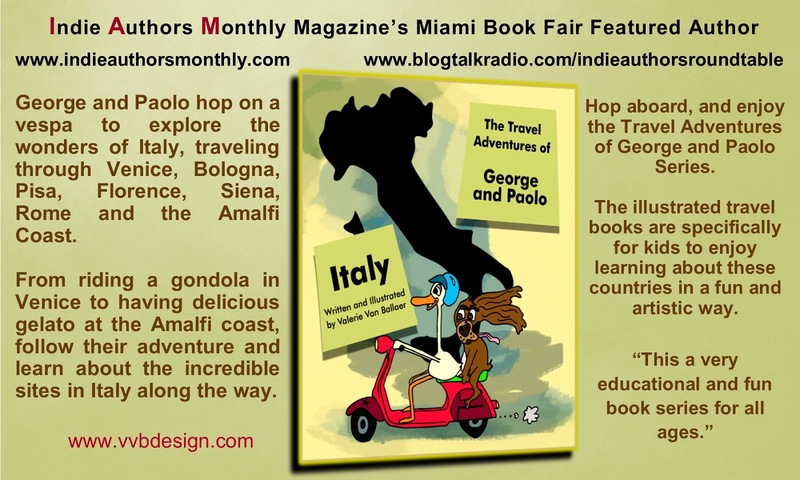 George and Paolo hop on a Vespa to explore the wonders of Italy, traveling through Venice, Bologna, Pisa, Florence, Siena, Rome, and the Amalfi Coast. From riding a gondola in Venice to having delicious gelato at the Amalfi coast, follow their adventure and learn about the incredible sites in Italy along the way. If you like Lonely Planet Kids' City Trails books, then you'll enjoy The Travel Adventures of George and Paolo. Kids will enjoy learning about Italy's many wonders. This book is perfect for kids who have traveled to, are planning to travel to, or are simply interested in Italy. 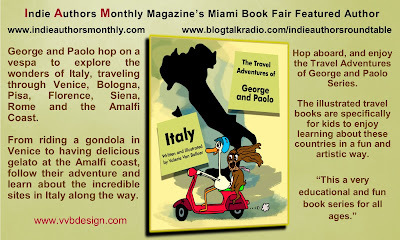 About The Travel Adventures of George and Paolo series: These books are based on the author's own travel experiences in these countries, with checklists of the top recommended things to do in each city. With so many travel guides and books for adults, from Lonely Planet to Rough Guides, these illustrated travel books are specifically for kids to enjoy learning about these countries in a fun and artistic way. Valerie is an illustrator & writer who has created a unique kids travel book series called "The Travel Adventures of George and Paolo". On top of this Valerie is a freelance graphic & web designer @vvbdesign, marathon runner, and traveler, born in Belgium, raised in Thailand. Follow her on Instagram for insights and to stay up to date on her latest books and adventures.